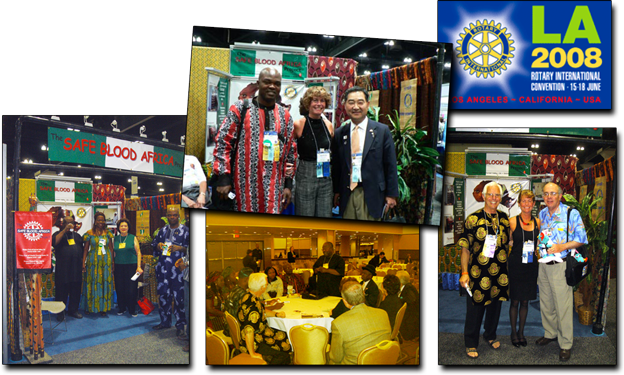 Above clockwise: At the Rotary International Convention in Los Angeles, the Safe Blood Africa Project booth had a GREAT location in the convention hall - just next to the food court! Nigerian SBA Team Leader Yinka Babalola, Jamison Kaufman and PDGNE Young Koh in front of the booth; Immediate Past President Warren Kaufman, current President Jamison Kaufman and President Elect Lewis Leader at the booth; the “round table gathering” of Nigerians after the All African Breakfast at the Wilshire Grand Hotel. Also in attendance was DGE August Hioco, and DGN Bob Eurich with his wife Sharryle; the SBA booth was filled constantly!